This holiday season, I gathered gift guides and wish lists from local businesses, creative-types, friends, bloggers, makers, and do-ers I admire. 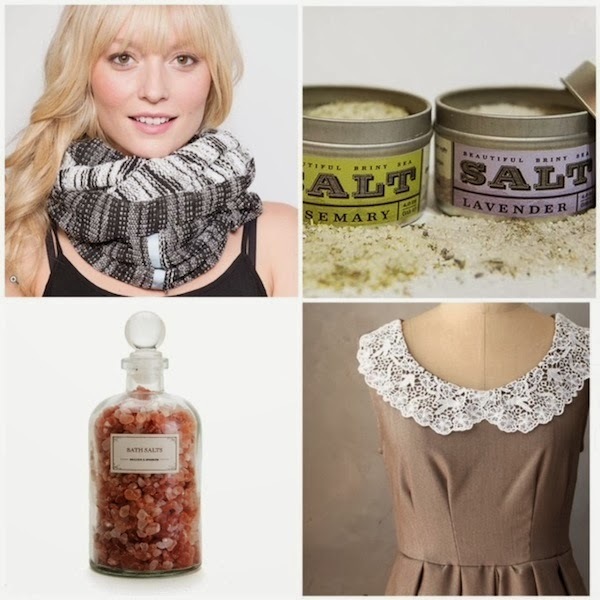 Gifts are by no means the important part of the holidays, but I wanted to give local makers a chance to toot their own horns, and it's fun to peek into friends' wish lists. So far we've heard from beautyeveryday, Edith on Fashion, Community, and Double Dutch Press. Don't forget to check out the exclusive discount codes many of these shops included in their posts! 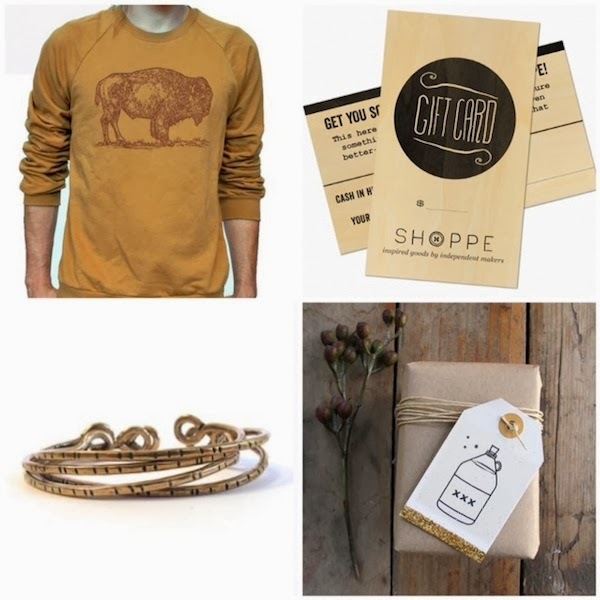 Scoutmob Shoppe is a curated online marketplace that promotes independent makers. We find artists that pique our interest, tell their stories, and drive traffic to them -- all to help them make a living off of their crafts. I'm an advocate of making my own gifts, but if you're gonna buy online this year -- please buy from Shoppe. The talented makers and my hardworking crew will love ya for it. Use the promo code "ARROWHEAD15" for 15% off until 12/26! If I could, I would adorn my entire body with all things Laurel Hill. Everybody should have an arsenal of Beautiful Briny Sea Salts in their kitchen (magic unicorn and lavender are my favorite). I know these are really nice on their own, but the packaging does it for me on these pink himalayan bath salts from Mullein and Sparrow. When giving the gift of booze - may I suggest some glitter moonshine gift cards? The no brainer: Shoppe $25 gift card. I could see you (Alyssa) rock the helloutta this Italian wool cape. We just got these exclusive Sarah Watts Prohibition era cocktail prints based off of some classic Holeman & Finch recipes. I adore these perfectly feminine dresses from Fleet Collecton, I own the Lace Pirouette dress and plan on double dipping it at a few holiday parties this year. These turbans from Robin Hoods are classic, one size fits all, and there is a really touching story behind it to boot. Stolen Sunday scarves are made in SF and are the perfect layering piece for fickle days and traveling. And since I'm plugging products, I might as well shoot for the stars and give a shout-out to this painting from Anca Gray and these vintage watches from Doughboy. I got one of these Mercy Grey Design Co. purses a few years ago. It is so durable and fun.. you'd think it would've died considering what all I put it through. (concerts, traveling, just being my 3rd arm.) It's a total champ! If you'd like to see more, go to www.scoutmob.com. We're updating products constantly and we have some handy gift guides and collections for maximum perusing.